Just don’t read the text on the jersey. Nick Richards had the right idea. After setting a screen on the right side of the arc, the Kentucky forward rolled toward the lane and found himself open as two defenders converged on ball-handler Keldon Johnson. Richards received the pass and turned toward the hoop, where he had a good look at a layup or even a dunk, given that there was no defender between him and the rim. The sole mistake Richards made, his ultimate undoing, was attempting all this without first traveling back in time to Marion, South Carolina circa 2010. There, he might have tried to persuade a young Zion Williamson to focus on football. You’ll be good, Richards might have said, just trust me. You’ll go to the NFL. He would probably have been right. In our timeline, though, Zion chose basketball, and also a team wearing a slightly different shade of dark blue. In this timeline, he was also moving toward the rim. 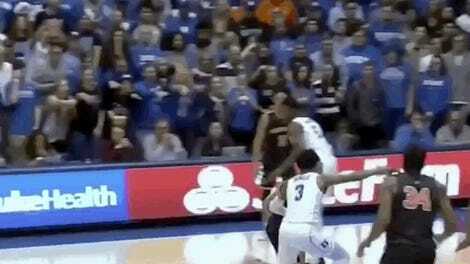 Zion rose like a polar bear imbued with the power of levitation and coolly removed the ball from Richards’ hands. It was a “block” on the scoresheet, but it felt more like an existential mauling. It was also not the end of the play. Duke would finish the game by handing Kentucky coach John Calipari the worst loss of his career at any level. Since then, Duke has lost one game—by two points to a talented, experienced, and motivated Gonzaga team—and dominated weaker opponents. They will probably never again play at the level they hit in their opener against Kentucky, if only because college teams, even ones this talented, don’t really ever look like… that. But that night, in a clash between two coaches and programs that have dominated recruiting since the NBA bailed out college basketball by building a one-year detour into the prep-to-pro pipeline, Duke embodied both the sublimity and the absurdity of the one-and-done era. With that era’s end now likely just a few years away, it makes sense that this Duke team would be its ridiculous apotheosis—the final form of something that never should have existed in the first place. This year’s team is an abrupt break with even the very recent past, because it makes sense. Last year’s team had little choice but to play two lottery-caliber post scorers alongside one another, because what else were they going to do with Marvin Bagley III and Wendell Carter Jr.? The previous season’s squad—on which future first-rounders Jayson Tatum, Harry Giles, Luke Kennard, and Grayson Allen struggled to share the ball—bowed out in the second round of the tournament. Both teams flailed around all too often on defense. So did the 2015 title team, which featured Jahlil Okafor, Justise Winslow, and Tyus Jones, until they installed a zone that Duke, in a break with Coach K’s long-standing defensive philosophy, would shakily continue to lean on for the next few seasons. This year’s iteration plays very little zone and capably switches defensive assignments. They often run a full-court press, and few college teams in history have converted turnovers into buckets with more spectacular ferocity. Ken Pomeroy’s advanced stats rankings say Duke has the third-best defense in the country. Just last night, Duke gutted out an ugly game against previously undefeated Texas Tech by playing elite defense from wire to wire. It helps that Barrett, Reddish, and many of Duke’s role players can play multiple positions on both ends of the court, but the overwrought “earn everything” rhetoric Coach K deployed in front of ESPN cameras in the preseason certainly seems to have imprinted itself on the specific teenaged brains for which it was intended. Dominance in recruiting will get a team ESPN time slots and some guaranteed virality, but there’s little evidence to suggest that it’s the best path to championships. And of course there is also Zion. Many have said—and as draft hype accelerates in the new year, folks, they will be saying it more and more—that Williamson is unique. They are right, of course. It’s hard to be hyperbolic when describing a levitating polar bear who sees the court through an infrared targeting system. He can and very much does play all five positions; both counting and advanced stats say he is an unholy and indeed unprecedented terror. He’s also apparently a good leader leader and a better quote than many NBA stars, and he does things like go out of his way to include forgotten redshirt freshman Joey Baker in media events. Duke’s immovable legacy of obnoxiousness may have met its irresistibly likable force. So far, as embodied in Zion’s instantly iconic block-to-assist sequence against Kentucky, the team’s intensity on defense has translated to fluidity and cohesion on offense, and back again. It’s a welcome contrast to the congestion and stasis that plagued other freshman-led Duke teams. This year, Duke looks like neither the suburbo-mythic Duke of yore nor the frustrating tangles of talent of the past couple years. 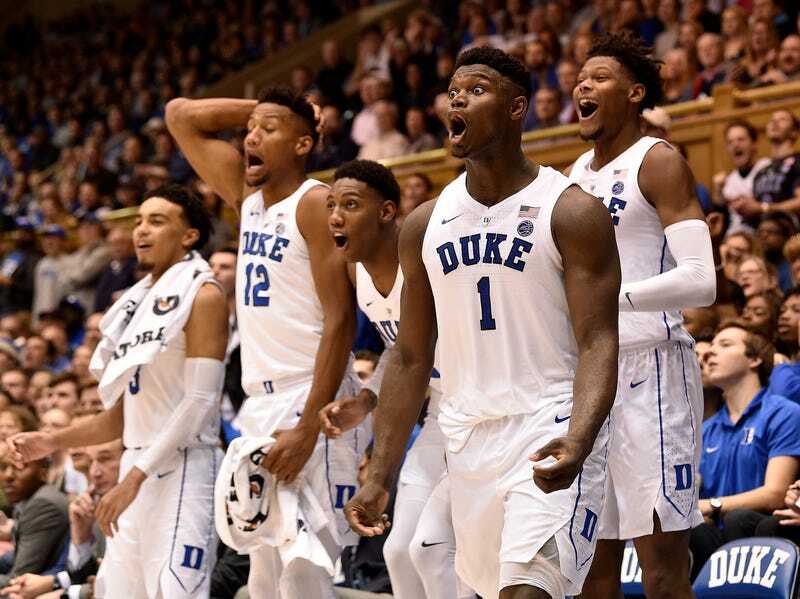 Zion’s Duke plays like the collegiate bleeding edge of the best basketball practiced at higher levels—position-subversive, driven by playmaking incision as much as raw athleticism. And yet, for all this firepower and chemistry and determination, they are not runaway favorites to win a championship. There is no such thing. College basketball does not have a Bama, thank God. To date, only 2012 Kentucky and 2015 Duke have won championships with teams centered on collections of one-and-done freshmen, which is as many as Villanova has won since 2016 with veteran-laden teams. Dominance in recruiting will get a team ESPN time slots and some guaranteed virality, but there’s little evidence to suggest that it’s the best path to championships. Calipari’s first recruiting class at Kentucky, which included Eric Bledsoe as well as John Wall and DeMarcus Cousins, featured the future first overall pick in the NBA draft and has combined for nine NBA All-Star appearances and three All-NBA honors. That team also lost to West Virginia in the Elite Eight. The champion that year was an upperclassmen-led Duke team. If Boogie Cousins and John Wall can lose, so can Zion and Barrett. Whatever might have enabled Duke’s particular appeal to recruits—Kyrie Irving FaceTiming in to tell kids they’ll get a job at a hedge fund if the NBA doesn’t pan out; slickly produced ESPN documentaries; more free Nike shoes than you can shake a federal indictment of the other shoe company at—the program’s success is a case of the rich getting richer, in this case by outmaneuvering a powerful rival in the perverse one-and-done arms race. The spectacle of a hegemon consolidating its power—and optimizing its branding as it does so—can make even this alumnus feel queasy. There is a similarly visceral counterpoint to that unease, though, which is that Zion Williamson creates joy. This is the saving grace or cosmic alibi or most plausible justification for all this, and how convincing you find it probably has a lot to do with your emotional relationship to college sports. To me it’s the joy of watching the best incarnation of something that shouldn’t even exist, in a moment when so many things feel like they simply can’t go on much longer. It’s the joy you can get only at the end, like the joy of the last day of school.